I learned pager code just as it was going out of style. I think it was the day before every single person in America got a cell phone. Do you remember that day? One day, cell phones and car phones were bulky and ridiculous, and the next day everybody had a Nokia. And I remember a day in mid-2002 when I sat on the phone with a guy from Verizon for 45 minutes while he convinced me to add a text-message package to my plan. People in college made fun of me for sending text messages, and then boom! It caught on like gangbusters. 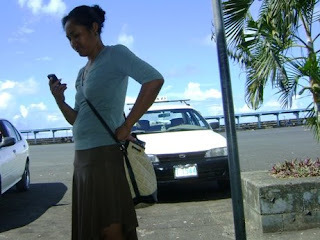 From what I understand, cell phones are relatively new to Samoa (sometime around 2006/2007? ), but they have already seen the same cultural phenomenon: overnight, it seems, everyone has one. 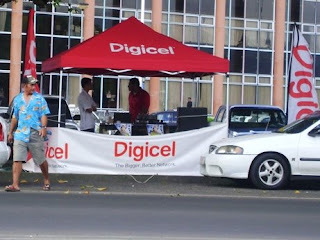 Digicel came in and put up towers and SamoaTel’s GoMobile was hot on their heels. 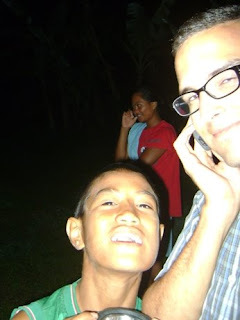 From there, free market capitalism has made sure every family in Samoa has a cell phone. And it makes sense. I would assume the overhead is much cheaper for the phone company. Instead of laying cable all over the island, they simply put up a few cell phone antennas and hook them up to a satellite dish. Done and done. That said, there is one crucial difference between cell phone use in The States and cell phone use in Samoa. 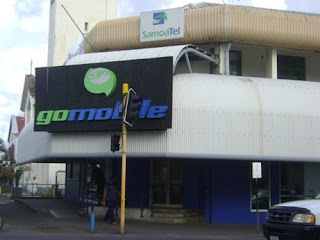 Since Samoa is a developing nation and credit is still a bit of a foreign concept, no one has a monthly cell phone plan. Everything is prepaid. This brings a completely different mentality to budgeting minutes, making calls, and even deciding what to say in conversation. With a monthly plan, a user pays a flat fee and is allotted a certain number of minutes or messages. The closer you get to your limit, the less you pay per minute or per text. Thus there’s an obligation to use those minutes or those messages. With a prepaid plan, the cost of minutes is fixed. If I don’t use the minutes, I don’t have to pay for them. There’s an obligation to talk less. Also with prepaid plan, I don’t have to pay if someone else calls me. This creates an awkward dynamic on the phone in which the two parties are always aware of who is paying for the phone call. A couple months ago, I missed a call from Supy and I called him back. We talked for about 10 minutes, and at the end, he was very apologetic because he knew I was paying for a phone call he’d initiated. Who cares, Supy? Although, this is sometimes abused. I missed Supy’s call because I was washing dishes. But occasionally my phone will ring and the caller will intentionally hang up before I have time to answer. There’s no connection fee, so the caller isn’t charged. Then when I call back, the original caller now gets to talk for free. It’s a clever trick, easy to fall victim to when you’re new to prepaid calling. Gudnyt nd sweet dreams 2 u 2! Oh… Nd hope u have a gud day 2mawo! Nyt! Hey! Waju up 2? It ws nice seeing u 2 day! Nice ie faitaga! Flood advisory now enforced 4 rivas streams vulnerable 2 flood due 2 heavy showers. Call me if u need help. During the village stay, it happened to me a few times when someone from the village would ask to see my phone and then would immediately and unapologetically start reading my text messages. At one point I started texting in Spanish to maintain privacy. The worst part of a prepaid phone is running out of credit. Digicel does have a function that allows a user to send a text message reading “Please call me” to a limited number of other Digicel users. Oh! And after I posted that I’d talk about cell phones today, I had to confiscate 2 cell phones from my year 12 kids today. What a fun coincidence. I hope you’re enjoying your unlimited nights and weekends. Pictures below. 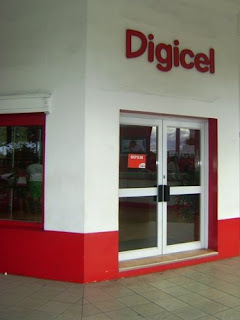 The main Digicel store on Beach Road. The main GoMobile store a block away, also on Beach Road. The new basilica (still under construction) in Leulumoega already has cellphone antennae in the belfry. Me and Tuese on our cell phones. Yuppies. As I said above, part of the reason that cell phones have spread like wildfire in Samoa is the ultra-competitive face-off between Digicel and GoMobile. This means lots and lots of promotions like the one above that was going on today. 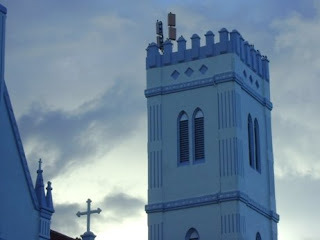 Thanks for putting up that photo of the church in Leulumoega... love reading your blog n seeing photos from Samoa. Just wondered...do you have a Matt Mafia running around for you taking pictures and gathering data for your blog? Or is this all by your lonesome? Amazing. ive found out digicel lets u top up online! i thought its super cool because now i being over here, can send credit to someone over there- in samoa!